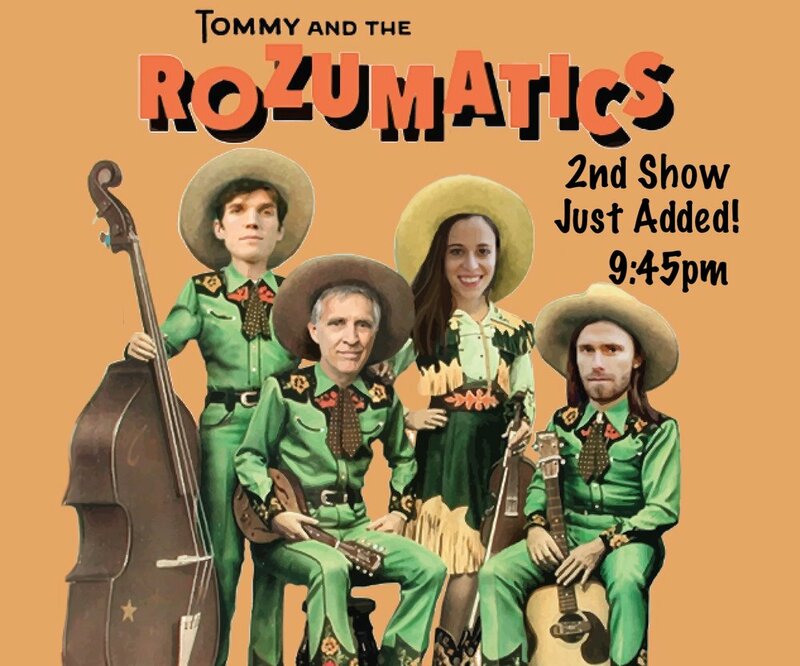 Tommy and the Rozumatics - 2nd Show Just Added! *UPDATE: Due to popular demand, a second show has just been added. The first show will now start at 7:30pm (doors at 6:45pm), and the second show will start at 9:45pm (doors at 9:15pm). The second show will be slightly shorter due to the later hour, and tickets are priced accordingly. Tickets are $20 and are available at the link below. We accept cash only at the door (ATMs are nearby). Acoustic music fans will know Tom Rozum as mandolinist and featured vocalist with Laurie Lewis and the Right Hands. Here, Tom's legendary musicality and keen wit will take center stage, featuring an all-star band comprised of fiddle phenomenon Brittany Haas (Prairie Home Companion House Band, Crooked Still, Dave Rawlings Machine), Tristan Clarridge (Crooked Still, Darol Anger, The Bee Eaters), and hammer dulcimer wizard and bassist Simon Chrisman (Bee Eaters, Jeremy Kittel Band). These four friends share decades of history as friends, bandmates, and musical inspirations to each other. They're coming together for a rare and special 4-day tour, to share songs and tunes near and dear to them, drawn largely from Tom's critically-acclaimed solo record, Jubilee, a deft collection of little-known gems of country, bluegrass, western swing, and old time music interwoven with great contemporary songs by David Olney and Mark Simos. Tom Rozum has played mandolin professionally for over 40 years, recording and touring internationally with Laurie Lewis for the last 30. He has contributed his mandolin playing and singing on over twenty albums (two were nominated for Grammys), including three duo projects with Laurie and a critically-claimed solo project of his own. He has also taught mandolin at over a dozen music camps, and performed several times on such radio shows as The Grand Ol’ Opry, A Prairie Home Companion, Mountain Stage, and E-Town. Brittany Haas is widely regarded as one of the most influential fiddlers of her generation. Raised in Northern California, Brittany grew up honing her craft at string camps, and developed her unique style with the influence of her mentors, Bruce Molsky and Darol Anger. Haas began touring with Anger’s Republic of Strings at fourteen and released her debut solo album at seventeen. She continued to perform and record while earning a degree in Evolutionary Biology at Princeton University. She has now toured for nearly two decades with such groups as Crooked Still, The Tony Trischka Band, Steve Martin, Yonder Mountain String Band, Hawktail, The Dave Rawlings Machine, and the Prairie Home Companion House Band. Tristan Clarridge is a 5-time Grand National Fiddle Champion and a pioneering cellist, synthesizing traditional folk influences with rhythmic vocabulary from jazz, rock and pop music, and leading a revolution among adventurous young cellists throughout the country. He has toured the world with bluegrass/nu-folk sensation Crooked Still, chambergrass innovators The Bee Eaters, and Darol Anger’s Republic of Strings, as well as Mike Marshall, Bruce Molsky, Cape Breton fiddle phenomenon Natalie MacMaster, and many others. Hammer dulcimer virtuoso Simon Chrisman brings a whole new approach to an instrument that has previously been thought to have limited range and technique. His inventive virtuosic touch and sophisticated rhythmic sensibilities are redefining the instrument and earning the attention of musicians from all over the world. He tours with percussive dancer Nic Gareiss and the Jeremy Kittel Band, among others. Tickets are $20 and are available at the link below, or you may purchase your tickets at the door the night of the show. Doors open at 9:15pm. We accept cash only at the door (ATMs are nearby). Tommy and the Rozumatics - 1st Show SOLD OUT, Thank You!